If you've ever noticed a snake with blue eyes, you've caught a glimpse of a natural phenomenon: the snake is about to shed. The color change is often referred to as "going opaque" or "going blue," and it's a sign that a snake is ready to unveil his new skin. A snake with blue eyes is getting ready to shed. This eye color change happens as a result of skin loosening and fluid building up between the old and new skin layers. At the peak of this transformation, the snake's eyes take on a milky blue or blue-gray color. 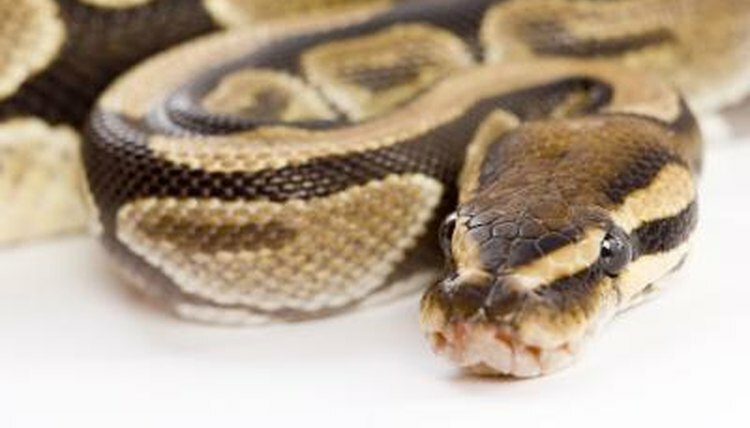 This pre-shedding event can take one or two weeks, and it makes the snake nearly blind. Most snakes shed a few times per year, with younger snakes shedding more frequently. Besides the change in eye color, there are other signs a snake is getting ready to shed. Its skin may appear dull, and it may become aggressive, hissy or refuse to be held or touched, in the case of captive snakes. Some may refuse food, at least until their eye color clears. Once their eyes clear, it means the shedding time is near. Some then regain their appetites, but others wait until after they actually finish the shedding process. Snakes should shed their skin in one piece. If it comes off in multiple pieces, it can be a sign of malnutrition, stress or low humidity. The blue eyes associated with the pre-shedding phase may last a while, but the shed itself can take just a few hours. If it takes longer, and if the skin comes off in pieces, it's considered a problem shed. With a captive snake, the caretaker should remedy any problems like diet, humidity levels and illness. Once a snake's eyes are no longer blue and it sheds its old skin, the new skin is ready for the world. In the case of captive snakes, caretakers should make sure the entire old skin is off, including around the head and eyes. The old skin around the eyes is known as eyecaps or spectacles. If you're helping a snake along with the process, wash your hands afterwards, as many snakes carry one or more forms of salmonella bacteria.